"Any event, once it has occurred, can be made to appear inevitable by a competent historian." Absinthe rocked the world of Paris a century or so ago, with such pervasive and controversial force that it was called the "green fairy." You can see a famous 1890s painting of said fairy, and much else about the liquor that's been enjoying a reconstituted revival, via this link. ... and got it wrong. This infographic was spotted on Bitrebels. One of the things we took in during our visit to San Diego was a stop at the Maritime Museum, which is downtown and consists of several vessels (including not one but two submarines, including a Russian one dating from the cold war). The star attraction, though, is the Star of India, which the museum bills as the oldest active sailing ship in the world. The ship doesn't sail often, mind you; in November, the largely volunteer crew takes it out in San Diego's harbour for a spin, and it returns to service as a floating museum. To keep the Star of India ship-shape, maintenance is an ongoing challenge. 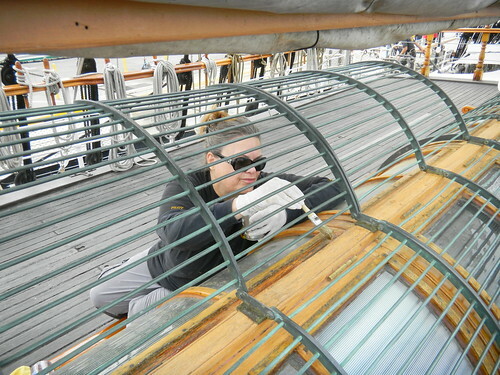 The morning we were there, this volunteer was removing laquer on the top deck, in preparation for a new application to come later. Not the easiest work, and it shows the dedication of the people keeping a slice of maritime history on top of the water. A great thing about having a very curious 11-year-old is that you learn all kinds of things, just by being around. Nick has asked me to record Nova, the PBS program, which I hadn't been watching regularly for years. I've been enjoying them anew, including one called Riddles of the Sphinx, from which I learned, well, much of what I now know about one of the world's best-known structures. It was absolutely fascinating. The Bayeaux Tapestry is a famous bit of fabric. It's not really a tapestry, but it's history, on cloth, and elements of it have been used to tell the story of early Britain. Here's a video that uses animation to make (a good bit of) it come to life. A highlight of my visit to Washington in April: the Abraham Lincoln exhibition at the Smithsonian's National Museum of American History, which included his inconic stovepipe hat. It had never occurred to me that the hat was a style choice, made for a political effect; that is, Lincoln was already tall enough, but chose a hat to ensure that everyone in a crowd could pick him out. Construction of an Emancipator is from Mike P. Mitchell, a terrific artist. A site that is helping a local cancer fundraiser evolve into a bit of a movement is the starting point for this week’s tour around the web. We’ll also check in some musical celebrations, keep up to date with heritage properties and learn about what makes cats ticks. Or purr, as the case may be. The first Shave for the Brave happened in 2006. In a few short years, it’s gone from a relatively small fundraiser for St. John’s-based Young Adult Cancer Canada, pulling in about $40,000 that first year to five times as much last year. Shave for the Brave now seems to have household name recognition in our area, with hundreds of kids and adults alike signing up to have their hair shaved off, with proceeds going towards programs aimed at young adults dealing with a cancer diagnosis. A couple of musical events are on the calendar for the coming weeks. The East Coast Music Awards are coming up in March in North Sydney; you can check out the nominees and such now, but keep an eye on the site for the weekend, as the ECMAs do boost their online presence. Meanwhile, there are just over seven weeks now do the Junos in St. John’s. The so-called Ruckus on the Edge celebration is still a little scanty on the details (i.e., who’s playing and when) but you can get a sense of how the full week will shape up. You can even enter a tune in a contest for the theme song. Hurry: the deadline for that is next week. I love The Oatmeal, which makes web-based infographics that are spot-on with the facts and fun to look at besides. This one is a list of remarkable facts about the common housecat, from their well-known visual acuity to the famous scientist who invented the cat door. The Newfoundland Historic Trust has been a force in the province since the 1960s, and has played a strong role in preserving – and cherishing – important houses, churches and other buildings. Its website has been freshly re-launched. Look for a Flickr-powered slideshow that will take you right around the province. The longest-running soap opera in the world is a British radio serial that airs six days a week, just as they’ve been doing since 1950. The story of the goings-on of a fictional farming village is also pretty addictive, even though there are more characters than anything in Dickens or Trollope. You can listen to BBC Radio 4 live if you like for your daily 13-minute serving, but you may find it easier to subscribe to the podcast. (It’s worth noting that The Archers is the most popular online program offered by the BBC.) The companion site is filled with detail, including synopses, character biographies and interactive features. Have you ever tried to get a group of different people – like volunteers on a committee, for instance – in the same place at a same time? It can be a bit of a challenge, particularly if people work in different places and have different schedules. Here’s a tool that can really help you. Doodle is a web-based tool that allows everyone to select scheduling options, or even make a group decision, without so much as a phone call. On Historical Tweets for today. There's a potter in the house, so this bit - a discovery in China that rolls the clock back on the start of ceramics by a millennium or so - will likely interest her more than me. But I found it pretty fascinating all the same.